Could you explain the following terms: di/dt and dv/dt? How should they be taken into consideration when working with both small- and high-power SCRs? I have seen many circuits in Nuts & Volts over the years that use triacs to switch AC loads. Now I want to switch a sump pump on and off using a triac. However, I can’t find a simple explanation on when a snubber circuit is required and when it’s not. To add to the confusion, I have seen references to new triacs that do not require snubbers. Know of any guidelines on snubber design and the values of the required components? I’ve put off this discussion for about two years now because of the math, where I have to distill calculus and imaginary numbers into everyday numbers for the hobbyist. The following equations are sometimes approximations, but close enough that they fall within the realm of everyday life. For the first part of the discussion, I will focus on the SCR, simply because the artwork is easier to draw, but what is said applies to both the SCR and triac. Let’s begin with di/dt — the rise in current through the SCR or triac in relationship to time. This is the amount of current (di) that the SCR experiences immediately after turning on. The inrush current is determined by the load resistance and normally applies to resistive loads, such as lamps. 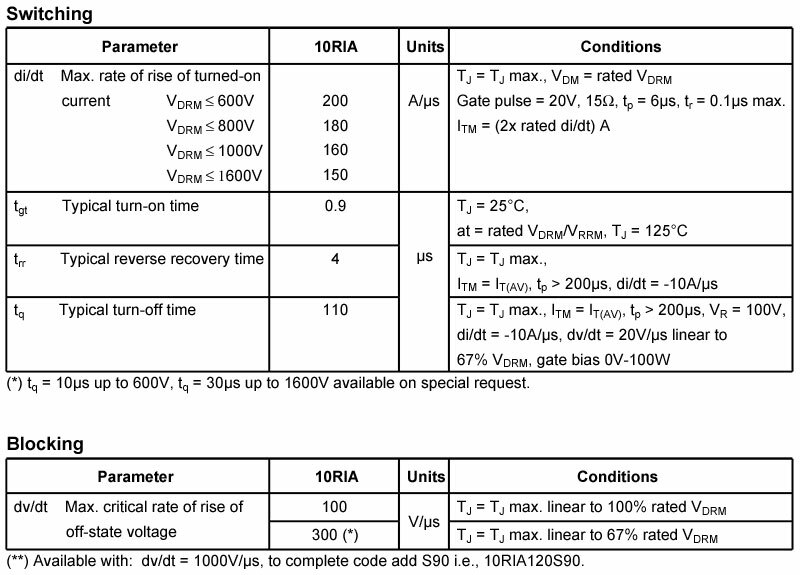 If the di/dt current exceeds the di/dt listed on the datasheet, kiss your melted SCR good-bye. Typically, the inrush current of a tungsten lamp is 20 times the operating current. If the current of the lamp is 12 ohms during operation, then its cold resistance is about 0.6 ohms — enough current to exceed the di/dt of the SCR. The cure is to insert an inductor in series with the load, as shown in Figure 2. 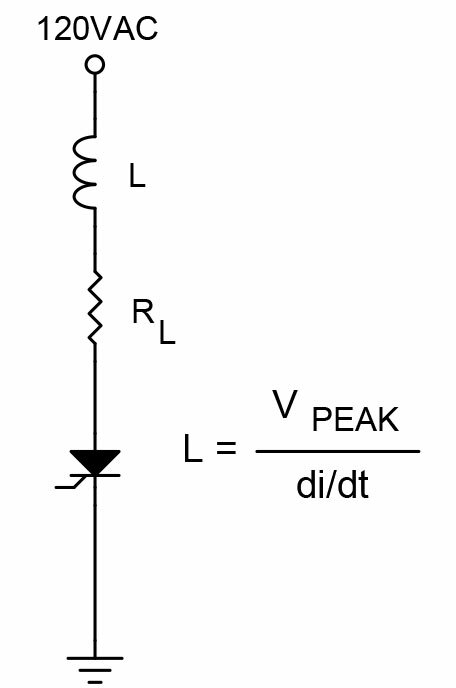 The size of the inductor is calculated by L = VPEAK / di/dt. Plugging the numbers into the example above, we get L = 169 / 200 x 106 = 0.8 µH. Don’t want to use an inductor? Then the math tells us that the lamp should be limited to 900 watts. If the load is inductive — like a motor — you can ignore di/dt. Inside the SCR are three parasitic capacitors — one of which is connected between the anode and the gate (Figure 3). And like all caps, it conducts current until it’s fully charged. When power is first applied — like closing a switch or breaker — current rushes in to charge this cap. 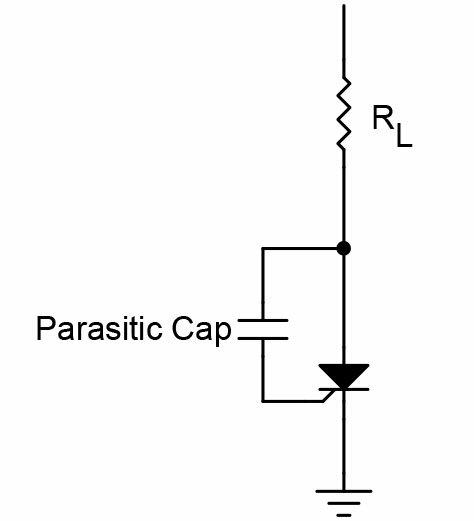 If the current through this cap exceeds the trigger current of the SCR’s gate, the SCR turns on. The critical rate of applied voltage is defined as dv/dt — the rise in voltage across the SCR in relationship to time. Here’s where the snubber comes in. Let’s assume RL equals 24 ohms — 5 amps at 120 VAC. Plugging the values in, we get C = 200 / (24 x 100 x 106) = .083 µF. I’d use a 0.1 µF, 200 volt cap. Once the SCR turns on, though, the charge stored in the capacitor is forced to discharge through the SCR — a discharge current that can exceed di/dt. To prevent this from happening, a small series resistor is inserted (b). The value of this resistor equals Rs = 10 VPEAK / (ITSM - ILOAD (peak)). For a 120 VAC circuit, this becomes Rs = 10 x 169 / (200 - 7) = 8.8 ohms. I’d use 10 ohms. The amount of peak current flowing through the RC snubber is I = VPEAK / R = 169 / 10 = 16.9 amps — well within the di/dt limit of 200 amps. The wattage of Rs is calculated using P = C x VPEAK2 x 1000 = 0.1 x 10-6 x 1692 x 103 = 2.9 watts. For this snubber to work, Rs must be smaller than RL. Otherwise the snubber capacitor will have little effect on suppressing the dv/dt spike. A way around this is to use the circuit in (c), where a diode is added to bypass the charging current around Rs. This way, Rs limits current only when C discharges. As an added benefit, the wattage of Rs is halved to 1.5 watts. The peak diode current is IDIODE = VDRM /Xc, where Xc is the capacitive reactance of C at (typically) 1 kHz. Plugging in the values, we get: IDIODE = 200 / 1592 = 0.13A. I’d use a 1N4003. 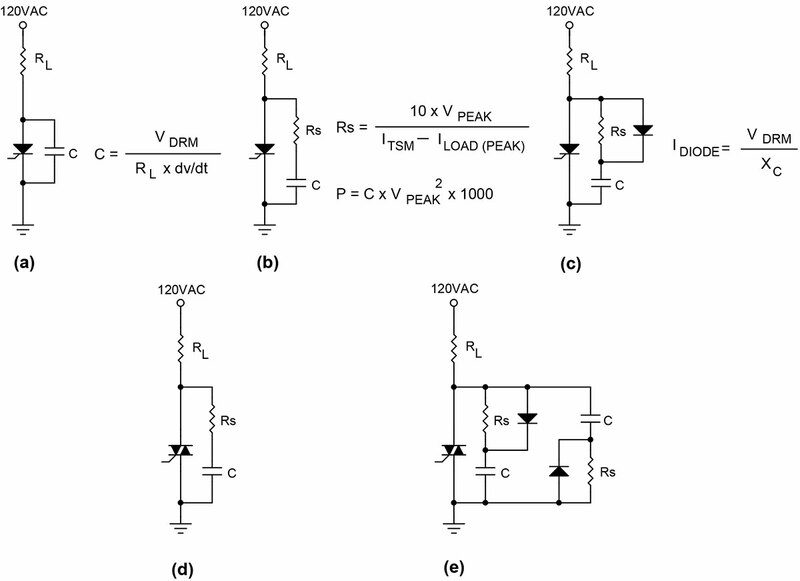 Want to use a triac instead? If Rs < RLOAD, then use the snubber in circuit (d). Otherwise, use circuit (e). As to the new non-snubber triacs ... let me see if I can explain. What the semiconductor engineers have done is change the geometry of the triac so that the size of the junction is smaller, which means less parasitic capacitance and less dv/dt impact. In fact, STmicroelectronics claims a 3x improvement with their snubbless triacs over conventional triacs. Does this mean you can build triac switchers without worry of adding a snubber? Not exactly. Repetitive overvoltage VDMR conditions — like the kind found in switching DC/DC converters — will cause false triggering and possible massive destruction in an improperly compensated design. Higher switching frequencies, too, add to the dv/dt problem. So are snubbers obsolete? Not today.